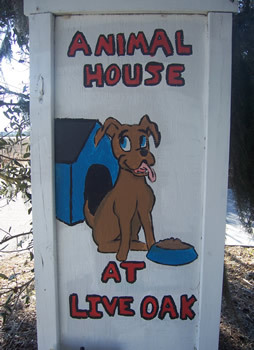 Animal House at Live Oak Boarding Kennels - Serving the Savannah Area! 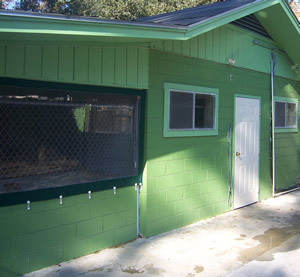 At the Animal House at Live Oak, we have dozens of boarding spaces for dogs and cats! Everything is climate controlled for cool summers and warm winters, and cleaned often to ensure a sanitary sleeping and eating space for your pet. Our standard dog runs are large and can accomodate even the biggest of pooches. 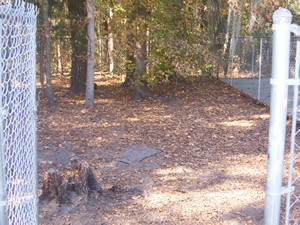 Boarders are housed individually by owner, and multiple dogs belonging to the same owner can be boarded together upon request. We also have a separate room in our main building for older dogs whom might be less tolerant of noise. Cats have the luxury of a space built to accomodate their upward and isometric lifestyles, with three distinct sections of shelves allowing them to jump and climb without disturbing their litter or food. Of course, their space is far away from any canine intrusion. Vaccination records are our only requirement, but it is an important one. Dogs must be up-to-date on their rabies, bordetella (kennel cough) and distemper/parvo vaccines. If you look at your pet's vaccination record provided by your vet, distemper/parvo is usually covered as part of a larger combination vaccine such as DHLPP or DA2PP. The vaccines may come in different durations such as a six-month variety, one year variety, etc., but we only require that the vaccine be current. We do make exceptions regarding distemper/parvo for dogs aged more than seven years. For cats, rabies and the FVRCP (or FVRCP-C) are both required. Everything else for your pet's stay is provided on-site, including food, blankets and water, but we accept owner materials and will distribute them as instructed. All dogs boarding at our facility take a minimum of three trips outside every day of the week, rain or shine. The dogs are kept individually in the yards during their outside time such that they can see, smell and hear other dogs, but to prevent fighting and minimize aggression they do not have direct contact with any others outside of the family. We have three natural yards with grass, dirt and trees, and the dogs may do what they please (except digging) while outside and off-leash. Cats do not go outside, but do take turns having free run of the cat room, along with its cat playtree, window and many shelves.